The nettle spread from Eurasia and now it's a weed common throughout the Northern hemisphere. But, as Jane Grigson observed, nettles are "not to be despised, especially at a season of the year when greenery is scarce". 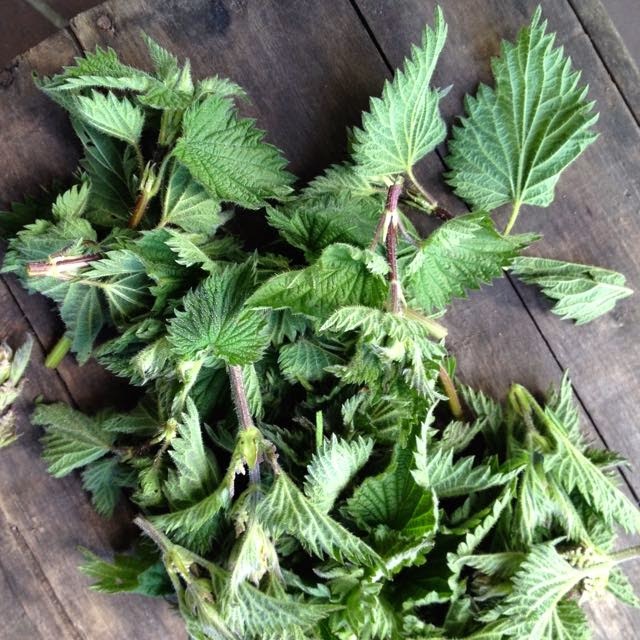 Revered by today's foragers, nettles have long been considered of value to "purify the blood" when eaten in April-May. Nettles are stocked with a cocktail of irritant chemicals, including histamine. Their tiny hairs act as effective needles to deliver a sting to unprotected flesh. 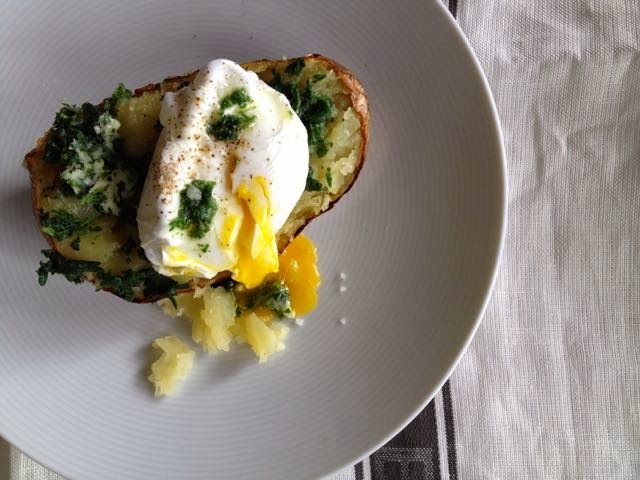 Grigson suggests topping a slice of fried bread with nettles and a poached egg or egg mollet, or pairing them with brains and a creamy sauce. Her suggestion of a take on that comforting dish, Champ, certainly appeals as does her nettle soup and nettle broth. If you exclude early season European imports, right now "greenery" is still scarce in the UK. Broccoli, the last of Spring's greens, is now rapidly going to flower, spinach and chard are hardly getting going and asparagus has all but come to a stop in the return to cool weather. I can see why the earthy mineral, quality of nettles was so valued. Last week I harvested the remainder of my sprouting broccoli, pulled some spectacular rhubarb and then looked around for what else was available. The strawberry patch was being over-run by a thick carpet of nettles so the answer was clear. A bag of weeds it was. Somewhere in the depths of my memory I remembered a recommendation to take only the top 6 leaves of the plant and these were duly, and respectfully, plucked with gloved hands. In Honey from a Weed, Patience Gray mentions the Southern Italian taste for nettles in a dish of Pasta colle Ortiche, though it's a recipe for Nettle Soup she chose to share. Soup is an excellent way to harness all the goodness this "weed" has to offer. It's good plainly served, just thickened with potato, or enriched with a little cream. The addition of a salty contrast of bacon or meaty snail is a good idea for the carnivore. Arriving home, top of my agenda was the need to preserve the plant before it lost all rigour, so I decided on a nettle butter. This way I could buy some time to decide on a recipe. Half the resultant verdant butter went into the fridge and the other half in the freezer. With all of these influences floating around in my head and with little time, I decided on a pairing of potato, egg and nettle butter and created a lunch dish that worked a treat. Pre-heat the oven to 180C (fan 160C)/Gas mark 4. Wash the nettles carefully. Cook in a covered pan with a splash of water and a pinch of salt for 2 minutes. Drain the blanched leaves, squeeze out excess water, dry well on kitchen paper and chop roughly. Mix the chopped nettles into the softened butter. Turn out onto greaseproof paper and roll the nettle butter into a sausage. Keep in the fridge until ready to use (or freeze it for another day). Rub the potatoes with a little olive oil and salt and bake in the oven for about 45-60 minutes. Getting a little more up-to-date, and rather more refined, Giorgio Locatelli in his doorstop of a book, Made in Italy, offers a Risotto alle Ortiche. 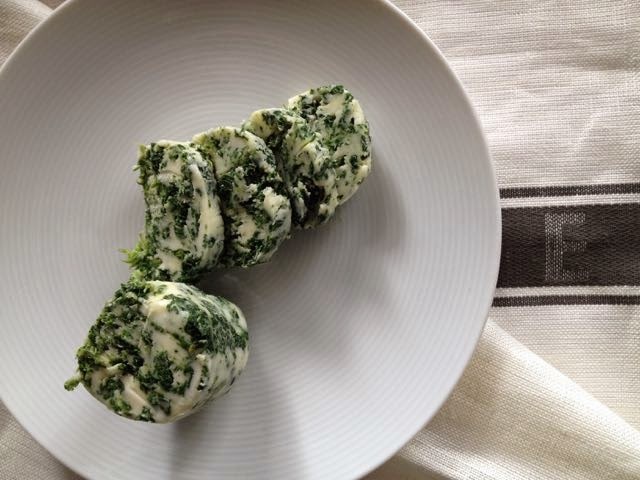 In One, Florence Knight favours a Nettle Gnudi, describing Gnudi as a "stripped-back gnocchi". Both recipes will definitely be getting an outing in this house soon. I never thought I'd be looking forward to harvesting nettles from the allotment.